NASA’s Kepler mission has detected no shortage of planets; more than a thousand candidates were discovered in 2011, a handful of which were Earth-like in size. 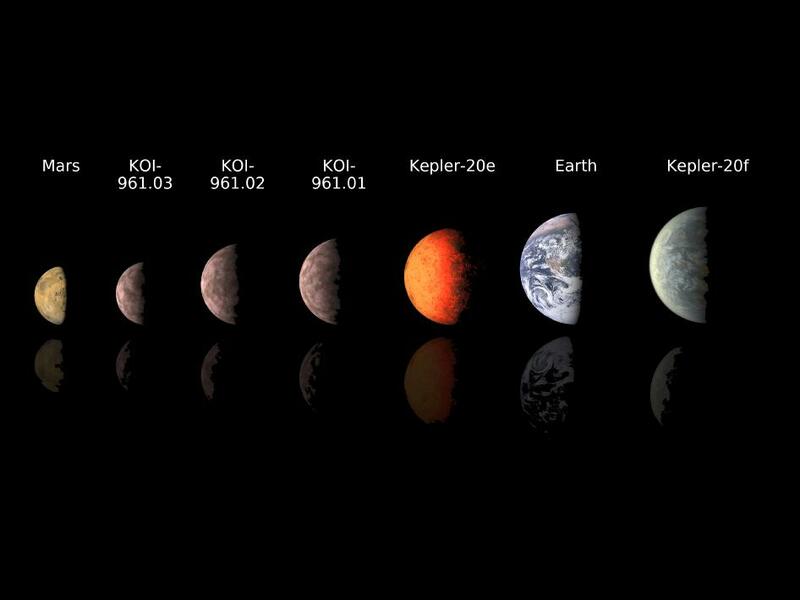 As data from the mission keeps pouring in, astronomers are continuing to confirm and classify these possible exoplanets. Today, a team of astronomers from the California Institute of Technology added three more to the growing list. They have confirmed the three smallest exoplanets yet discovered. Kepler searches for planets by looking at stars. The light from the star flickers or dips when a planet passes in front of it. At least three passes are required to confirm that the signal is from a planet, and further ground-based observations are necessary before a discovery can be confirmed. The Cal Tech team’s discovery was made with old data from Kepler. They found that the three planets are rocky like Earth and orbit a single star called KOI-961. They are also smaller than our planet; their radii are 0.78, 0.73 and 0.57 times that of Earth. As a comparison, the smallest of the three is roughly the size of Mars. The whole system is also small. The planets orbit so close to their star that their year lasts only two days. “This is the tiniest solar system found so far,” said John Johnson, the principal investigator of the research from NASA’s Exoplanet Science Institute at Cal Tech in Pasadena. The type of star is also significant. Red dwarfs are the most common stars in the Milky Way galaxy, and the discovery of three rocky planets around one suggests that the galaxy could be teeming with similar rocky planets. Source: NASA’s Kepler Mission Find Three Smallest Exoplanets. For once we can agree with Spock. Is there a relevant paper available? It’s unclear from this article how these exoplanets were confirmed. I wasn’t aware that the radial velocity method(which I’m assuming was used for the confirmation) could detect exoplanets of this size. Ask and you shall receive: Characterizing the Cool KOIs III. 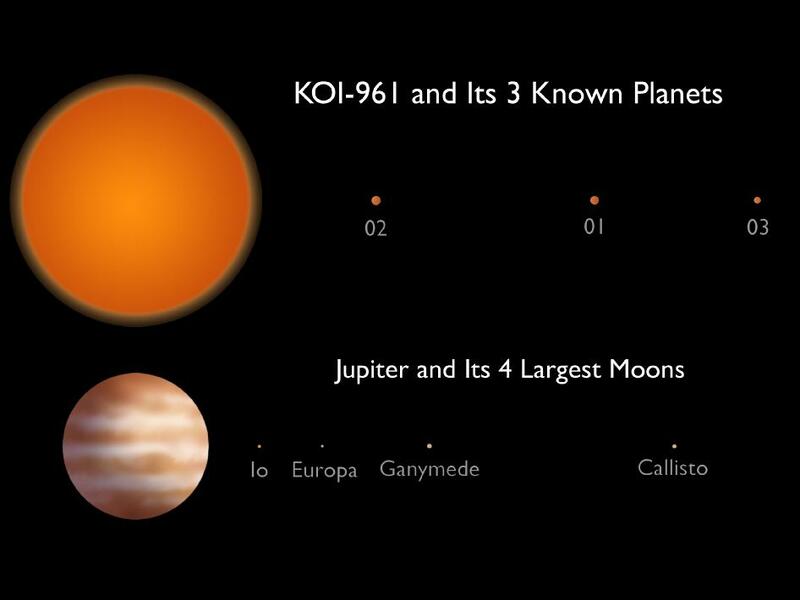 KOI-961: A Small Star with Large Proper Motion and Three Small Planets. People keep ignoring the pulsar planets. One of those is smaller than the moon. Good point! PSR B1257+12 A has a mass which, even at the maximum error margin, is barely twice the Moon’s mass, making it the lightest exoplanet discovered, I think (and it was one of the first discovered too). The size of the planet isn’t known, but has been modelled for a variety of compositions. It’s not smaller than the moon though – even if it were solid iron (which is considered unlikely), it would be roughly the same size. Chances are it’s made of something less dense, and may include a gaseous envelope, which could boost its size significantly.